If you’re an Apple fan, you probably know that today is the big release date for the latest version of the Mac OS, 10.5, a.k.a Leopard. The two and a half year span since the release of Tiger is short by Microsoft standards, but is the longest Mac users have had to wait for a major release in the six year existence of Mac OS X. From early reviews however, it appears to be well worth the extra time. I’m not going to attempt to write a review (haven’t had my hands on it yet) or rehash features here – both have already been done more times than I care to count. Apple is advertising over 300 new big and small features in Leopard, but I want to talk about a couple that have similar implementations on other operating systems but are transformed by the polish, execution, and attention to detail that Apple is famous for. Those two features are Time Machine and Spaces. The most talked about new feature in Leopard has got to be Time Machine, the built-in automated backup and restore application. I’ll be the first to admit that disaster recovery is unsexy and complicated for most, which is why hardly anyone actually does it. People shouldn’t have to learn the difference between incremental and differential backups, or go through the trouble of scheduling jobs and deciding what files to include. I’ve sporadically burned CD-ROMs of documents and copied important files to my USB thumb drive, but a full system crash would be big trouble for our family. Time Machine ends the need for these ad hoc backup methods by automatically copying files to an external hard drive whenever they’re changed and keeping a version history of them. It removes every excuse for not backing up your Mac, except for spending the cash to get an external hard drive. The main functionality of Time Machine has been around for decades: In the end, it’s just a backup program. Microsoft has similar technology in the last couple of editions of Windows called Volume Shadow Copy that basically does the same thing. But, because it’s hidden so well in the operating system, I’m guessing that 9 out of 10 people have never even heard of it. Unfortunately, the feature is largely inaccessible to home users since it requires either a Ultimate, Business, or Enterprise edition of Vista, or a combination of Windows XP and a server running Windows 2003. Also, shadow copies in Vista appear to be stored on the same disk as the operating system by default – an absolutely horrible idea if your goal is keeping a safe backup. So, the idea is the same, but Apple’s execution and attention to detail are way, way better than Microsoft’s. Just look at these two screens: Which one would you rather interact with? The other new feature I want to hit on is what Apple calls Spaces, an easy way to create separate workspaces to organize your applications and windows. This functionality too, is nothing new. 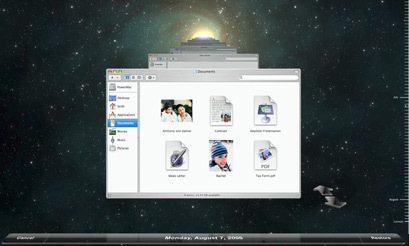 Users of UNIX and Linux based OSes using the X Window System have been able to take advantage of virtual desktops for decades. 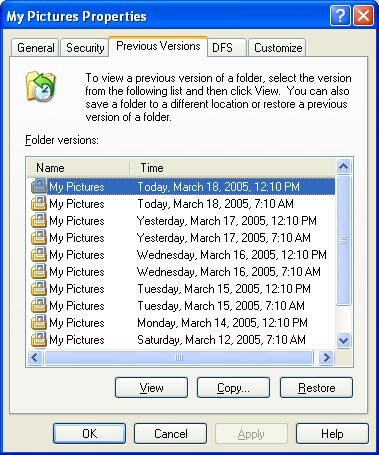 Historically, these features have been poorly implemented and directed toward advanced computer users. Apple appears to have put a lot of thought and work into Spaces, making it what is probably the most polished implementation of the virtual desktop idea we’ve seen so far. Take a look at this video to see how it works in action. Under the hood, modern operating systems all provide the same types of services and functionality. What makes OS X different is that it’s polished. Apple has paid attention to the small details and taken much effort to make things easy and intuitive for users. So, it’s true that Apple has copied ideas from Windows, and from Linux too. They didn’t just do quick ripoffs though – they dramatically improved the experience. And, when Windows and the Mac OS seem to be looking more and more alike, that polish, those small details, can make a big difference. The polish that Apple adds has been its trademark for years (it came back with Steve). I upgraded 3 systems to Leopard on day one. I had absolutely ZERO problems. (I can only remember having two problems since upgrading to 10.2.) I used the Archive and Install option. Polish is not a small matter. As a scientist, it helps me if I can be “Dr. Power User” without constantly hitting help files or reading through cryptic instructions. Also, there are lots of things in Windows you just can’t count on. Cut and Paste. 1980’s technology. Guess what? About 10% of the time it just plain FAILS in Windows– usually when I try cutting FROM IE. Embarassing! “Under the hood” is important, too. People, in general, fail to appreciate that: 1) Apple has made the transition to UNIX; to my knowledge, Windows hasn’t even STARTED. I’m hearing that “Windows 7” will be much like Vista. 2) Apple’s development tools, based on NeXTSTEP are probably 10-20 years ahead of Microsoft’s much-overrated “C#”. This will help Apple as more coders come to the platform (if only to write iPhone applications).3) Leopard offers a more compelling 64-bit solution than MSFT does; perhaps Apple server sales will improve. It’s hard to compete with “free”, like LINUX; but MSFT’s server offerings are vulnerable to competition, for sure.